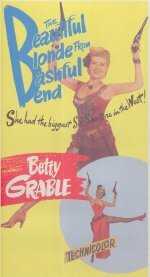 Though one of Betty Grable's better vehicles, this burlesque western was considered to be one of the major catastrophes of 1949, a major setback for its talented writer / director Preston Sturges, who had acquired a reputation for churning out adult, wacky, risqué comedies. Viewed today, however, this farce can be regarded as a comedy triumph for both star and director. Fabulously designed and photographed (by Harry Jackson) in that gloriously garish 1940s Technicolor, the film features a terrific cameo from daffy Hugh Herbert as a myopic quack.